The kids, along with their friend, spotted a wallet on a driveway while riding their bikes. They immediately returned it to its owner. AURORA — Haylie and Reagan Wenke are two Aurora kids who don’t think they’re any different from anyone else, but that’s not what the internet thinks. A video of them performing a kind deed has gone viral, with more than 150 comments and 1,300 shares praising the brother and sister. 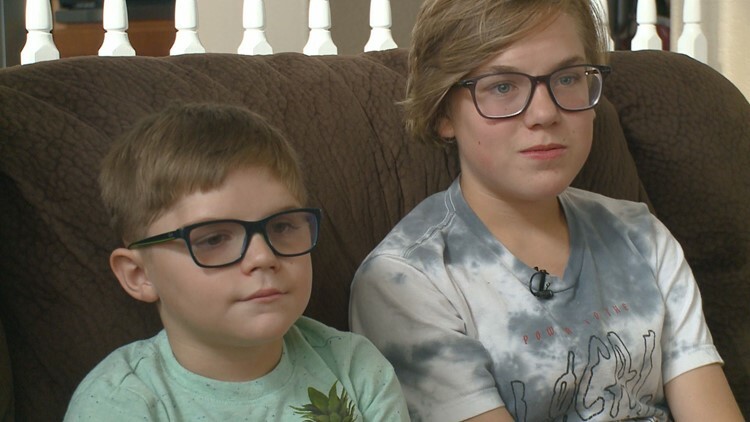 Haylie Wenke, 13, and her brother Reagan Wenke, 6, along with their friend, spotted a wallet on a driveway while riding their bikes on Wednesday, July 18. They immediately hopped off their bikes, walked up to the front door, rang the doorbell to announce they were returning the wallet and left it among some flower pots. They insist that they were just doing the right thing. “It wasn’t our money, and we didn’t really need it, so we just gave it back,” Haylie Wenke said. Haylie Wenke was the one who spotted a wallet in a driveway. In that moment, a lesson she learned came to mind. “If you see something that someone left or dropped, to always give it back and do the right thing,” Haylie Wenke said. That's a simple moral code that Nigel Drake, the owner of the wallet, doesn’t think a lot of people have anymore. Drake was walking into his house after getting off work from his bartending job when the wallet fell out of his pocket. “I was carrying stuff in, I guess I dropped my wallet outside, and I didn’t know about it,” Drake said. The his dad saw the security footage. Drake’s dad posted the video on Facebook hoping to find the nice kids that returned his son’s wallet, along with the $700 cash inside. Their aunt in South Dakota saw the Facebook post and immediately recognized her niece and nephew. She put their mom and Drake’s dad in contact with each other. Drake said they're trying to figure out the perfect thank you gift for kids.